Ok, for all of you who are not overnight oats fans, I apologize if my kick is starting to wear on you. This is my last oatmeal recipe for a while, so thanks for sticking with me for one last flavor! Over the past week I have introduced Spiced Pear + Walnut Overnight Oats and Chocolate Pistachio Overnight Oats. These two were definitely yummy recipes and I loved each of them quite a bit. However, the perfection of the Peanut Butter & Jelly combination just never gets old to me. Now that I have been able to enjoy this childhood sandwich in the form of oatmeal, I am one happy girl. And to top it all off, this recipe is full of fiber, protein and nutrients! Doesn’t get much better than that! 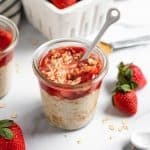 The “jelly” part of these oats is actually 100% fruit and you can easily alternate berries to change things up a bit if you like. However, pro tip–if you stir in a bit of jam with the fresh fruit, it takes this recipe up several if not ten notches. I know I have said it a million times but overnight oats really don’t get much easier. I make several at a time and have breakfast ready each morning. 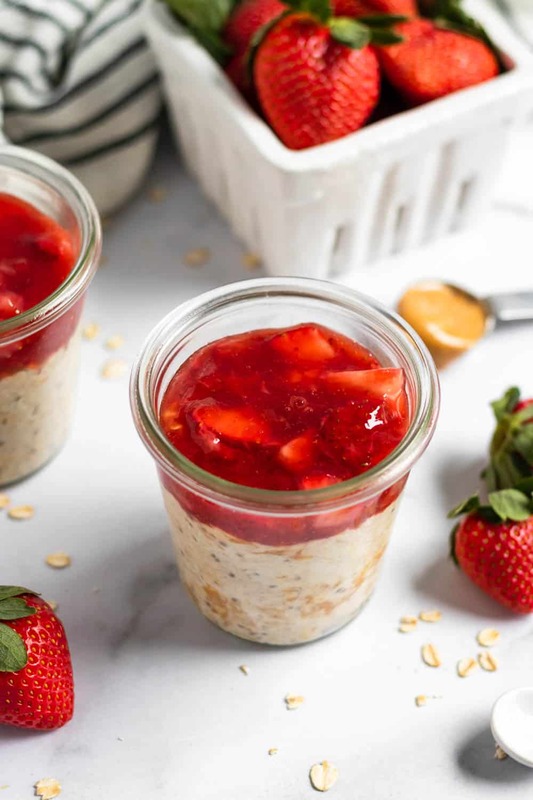 This peanut butter and jelly overnight oats version is the first kind that I actually ate cold instead of warm. If you decide to eat them warm, you may want to wait until you serve them to add the “jelly” part after heating them up. If not, add it when making and grab a spoon and dig in when you are ready. Also, if you have any sort of peanut allergy, add another nut or seed butter and enjoy these oats as well. So this wraps up a week of almost nothing but oats. 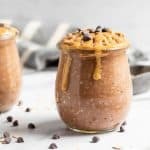 The Peanut Butter and Jelly Overnight Oats here is by far my all time favorite at this point but who knows what other creations are to come! 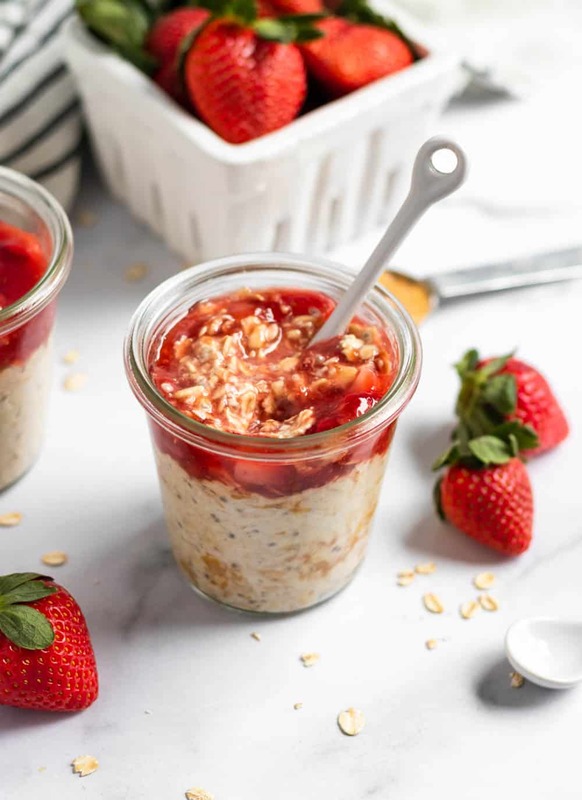 I have plenty more where these overnight oats recipes came from have a one stop spot where you can find all of the overnight oats recipes I have on the site. If you love these and want more options, head to www.mywholefoodlife.com where Melissa creates quite a few more of this perfect breakfast! Add all ingredients except for the berries to a bowl or jar that can be sealed. If planning to eat cold, mash berries with a fork until a jam like consistency and spread over top of oats. These oats were so good!! I was out of maple syrup so I used honey instead. Thanks so much for this! This is one of my favorites, Anne! Glad you liked them. And yes, honey always works great! I used Agave in mine and some sugar free jelly in a jar!! Can’t wait for the morning I licked my finger and it’s tasty already! You are after my heart with that! Lick away!!! ??? Any idea the nutritional content in this? Hi there! I actually don’t count calories or calculate these but if you plug the ingredients to an online calculator it should give you all the info. Thanks! 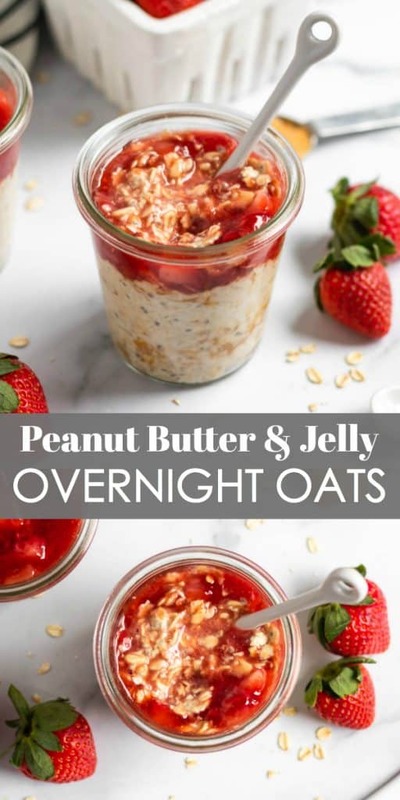 Overnight oats are my favorite for busy week days and this peanut butter jelly version sounds amazing! Love the added flax to give more filling fiber! Your oatmeal kick could never wear on me. 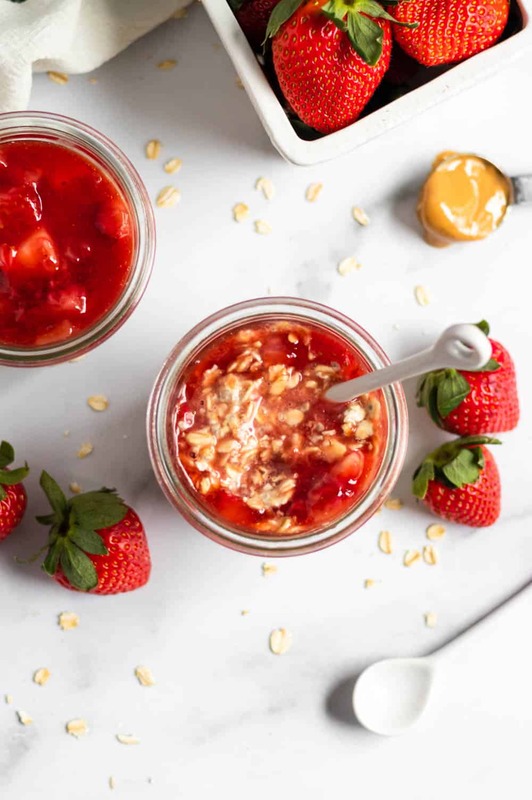 You are the overnight oats queen! Thanks for sharing another gem. I really never get sick of them. And they are soooo user friendly! MMM this combo! I didn’t like PB&J growing up but I will gladly take the combo in any form these days. Glad your taste buds have changed! I love the pb&j combo!! How delicious! Can never go wrong, thanks! You know I’m all over this, love the peanut butter and jelly combo! Simple, healthy, and delicious what’s not to love? I can never get enough of the pb&j combo! Love the idea of it in overnight oat form! Same. I will always be a kid at heart for this combo! 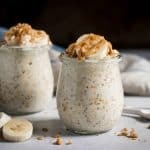 I love overnight oats! I’m going to make this next week. I’m loving the texture of these oats! Usually when I see overnight oats they just look slimy. But these look glorious and still chewy (which is how I like my oats). And you can’t go wrong with PB&J! Great point Laura. That’s what I like as well! Now this is a staple breakfast recipe. And it uses ingredients that I pretty much always have on hand. Love it! Can’t go wrong with pb&j! This looks and sounds delicious! 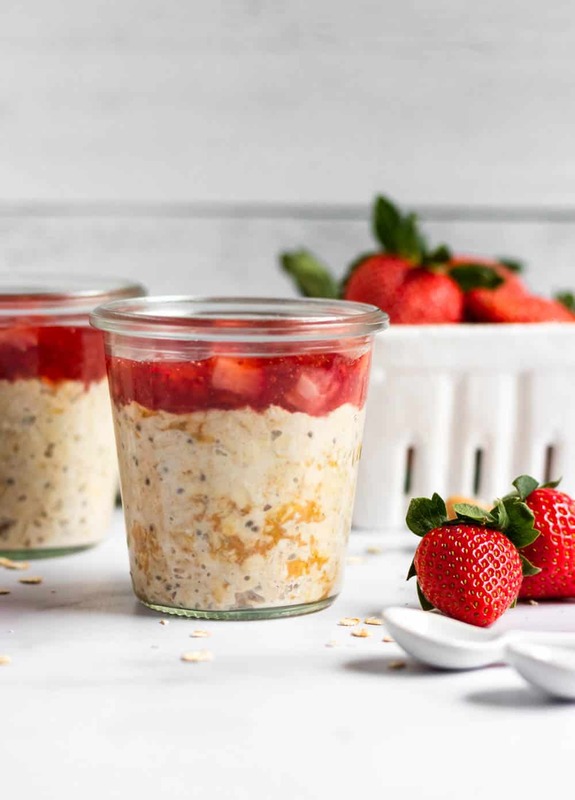 I love making overnight oats but dont ever try new recipes lol but definitely trying this one! Hope you love it Patty!